Screengrab of Jacob Arbinder article. Arbinder doesn’t mention TriMet, but his criticisms match up neatly with what advocacy all-stars OPAL – Environmental Justice Oregon and their partners have been saying for years. Only one of seven TriMet Board of Directors tasked with oversight of the agency is a frequent transit rider; the board is appointed by Oregon’s Governor, and thereby significantly inoculated from the pressures to oversee successful governance faced by locally elected officials closer to the ground (and, therefore, constituents). The national search for Niel McFarlane’s replacement concluded with one finalist candidate for General Manager, who appears to be McFarlane’s hand-chosen successor. Whether it’s on issues of budgeting for policing, fare enforcement, paperless passes, or choices about which transportation megaprojects the agency chooses to support, it’s difficult to agree with McFarlane’s assertion (to The Oregonian) that TriMet as an agency currently functions as “a very responsive system” when community members have no meaningful mechanism to hold the agency accountable. It’s difficult to agree with McFarlane’s assertion that TriMet as an agency currently functions as “a very responsive system” when community members have no meaningful mechanism to hold the agency accountable. The most charitable take on TriMet’s willingness to consider the three-freeway-expansions-for-a light rail line bargain proposed last year stems from an agency with an outdated understanding of the region’s needs and electorate. 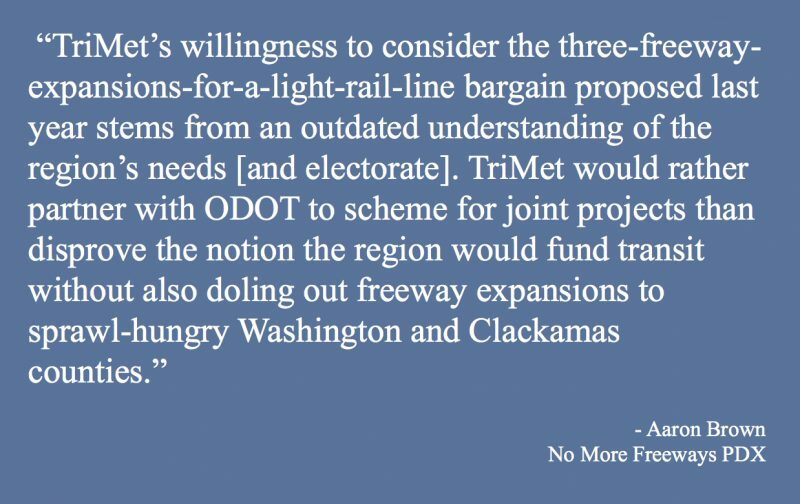 TriMet would rather partner with ODOT to scheme for joint projects than disprove the notion the region would fund transit without also doling out freeway expansions to sprawl-hungry Washington and Clackamas counties. This strategic conservatism is unwarranted; I’d argue it’s wholly counterproductive. Atlanta, Sacramento and San Diego have all recently lost regional transportation funding initiatives that focused on that elusive “balance” to placate suburban voters with freeway money. Meanwhile, Los Angeles and Seattle won $120 billion and $54 billion for massive, transformative packages that were exclusively transit-oriented. Seattle’s example is especially notable; their robust victory in 2016 that will transform the Puget Sound is preceded by ballot box failure ten years earlier, with a package that included significant funding for roads. 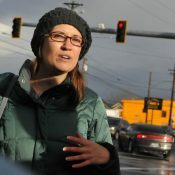 The inclusion of freeway funding in the 2006 package didn’t mollify suburban voters’ tax skepticism, and proved unpalatable to Seattle’s progressive voter base. It’s not difficult to imagine a parallel where Clackamas County’s tax skepticism, Washington County’s changing demographics and Multnomah County’s distaste for milquetoast climate policy leads to similar electoral defeat. Besides, it’s worth reiterating: even a successful “political compromise” that wins at the ballot with massive new freeway expansion but loses at the hard facts of science is still a loss. The region’s still stuck in gridlock, we waste a billions in taxpayer money, and we continue to fry the planet. No one planning on being alive in the next few decades should consider this an acceptable outcome. Selling public transportation to Portlanders should be like selling hockey to Minnesotans. Aside from our oft-cited history as land-use innovators, the share of the Portland region who falls into the category of the Rising American Electorate continues to grow. 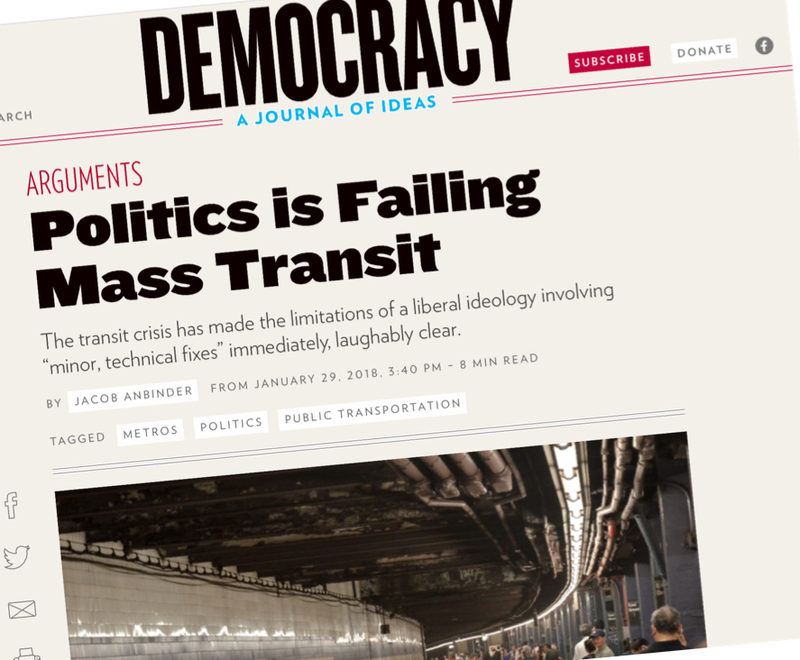 Better transit service and access to walkable communities is a policy that the various factions of the Rising American Electorate enthusiastically support, given its overlapping connections to justice, housing, and climate. Turning these constituents out to vote for, say, college student bus passes is only a difficult lift if TriMet isn’t actively in cahoots with organizations who turn out community college students to vote. Similarly, scholarship suggests America is seeing a wholly under-discussed resurgence of community organizing in the suburbs. The soccer moms (and after working on school bonds, I use the term “soccer mom” with revered endearment and appreciation) that hold their communities together with substantial unpaid volunteer work with PTAs, book clubs, and soccer teams are quite naturally talented at organizing community action; they do so every week just keeping their family’s errands on schedule and economic well-being afloat. They’ve successfully turned out the vote for numerous enormous school bonds across the region in the past few years, and have been instrumental in many of The Street Trust’s recent wins for Safe Routes to School funding. Groups like Business for a Better Portland are beginning to challenge the notion that Portland’s business leaders are monolithically committed to last century’s broken infrastructure and austerity politics. Metro, the regional government lining up major regional campaigns for massive investments in housing, parks and transportation, would greatly benefit with TriMet as a partner in pushing for healthier, forward thinking solutions and retiring outdated ideas. Our region’s transportation system is the connective tissue to communities across four counties and two states. It’s difficult to overstate how firmly the efficacy of our streets, buses and sidewalks fundamentally shapes our economy, our communities, our health and well-being, our lives. Too many advocacy groups, elected officials, and agencies are approaching our region’s woes from the unimaginative position of “what broken institutions do we have to work with” as opposed to instead asking “where should our region be in the next twenty years, and what political coalition realignments and structural reforms must we make now to get there?” As our planet veers into climate calamity and our region experiences continued growth and inequality, anything short of an honest reassessment of which infrastructure and programs our local government should support — and which to retire — is simply institutionalized and intergenerational theft and violence. 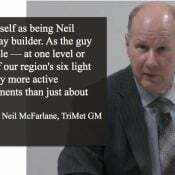 And candidly, if Mr. McFarlane and other top regional leaders have spent so many years navigating these agencies and they still fail to see how crucial bold leadership will be in the decades ahead as Portland navigates these overlapping challenges; well, it appears to be an appropriate time to wish them all well on their future endeavors. Let’s hope that TriMet’s next GM and future Board appointments choose to address these structural shortcomings and align themselves as accomplices in the creation of fulfilling communities and faster commutes — instead of freeway congestion. If you’d like to get involved with OPAL’s campaign to address TriMet’s lagging engagement with the community, check out their website (and be sure to chip in a couple bucks to OPAL while you’re at it). They’re holding a rally at the next TriMet Board hearing at 9:00am, March 28 in downtown Portland. If you’d like to help us stop this dumb freeway, check out the No More Freeways website, and throw us a couple bucks if you’d like us to mail you a button. 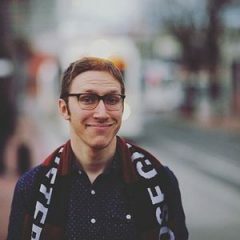 — Aaron Brown has held leadership roles in campaigns to raise over $950 million in local funding for public schools, sidewalks and regional parks, including the 2016 Gas Tax and the 2017 Portland Public School Bond. He served as board president of Oregon Walks for nearly four year. He lives in North Portland and gets around town with his Surly Crosscheck and the Number 4 Bus. And yes, on occasion, he drives. He’s online at @ambrown on Twitter and his personal website. This is perhaps the most intelligent, inspiring, and thoughtful critique on the institutional and political barriers that stand in the way of achieving a more equitable and accessible transportation system. Thank you Aaron for sharing your thoughts with us. I hope every transportation planner and engineer who reads this will reflect on what the goal of their profession/agency is and how their action/inaction perpetuates the legacy of racial and class injustice created by the same agencies and institutions that employ them. There is a myopic focus on building the next project or adopting the next plan and plagues the practitioners in the planning field. I think your article should prompt us to critically examine if what we are doing is enough to get us to the future vision we have for our city. If not, then we need to do something to change the status quo. The San Diego bill had majority support with 57% approval but it failed the two-thirds supermajority required in California for tax increases. The opposition included pro-transit groups who said the bill didn’t go far enough and anti-tax groups who wanted more funds for freeways and less for transit. “a ton?” My understanding is that it was nearly 80% not freeways, and it’s worth remembering that their voting district included a much larger, auto-dependent area and population, *and* that it passed with 70%. I would not call a measure that includes: three miles of general lane freeway expansion on 71, 18 miles of new truck lanes on 710 (now planned as a straight $6-10B freeway expansion, currently on pause at Caltrans), miles of truck lane/HOT expansions and general lane expansions on I-5, miles of new auxiliary lanes on I-405 and 57/60, miles of HOV/HOT “Express Lanes”, and LA County’s portion of a new freeway between Palmdale/Lancaster and I-15 – as an “entirely transit-oriented” measure. Not at all. At best it’ll be 60-70% transit, which will be great because it’s really needed. LA County is also leans a little to the left so it’s more feasible to get transit-heavy projects through. (Forget bike lanes; there’s been plenty of bikelash recently on road diets in LA). Metro had to include all of the freeway expansions in the plan to get approval. On the other hand San Diego County tends to lean slightly right of center so meeting the 2/3 requirement tends to be politically trickier (and as we found out later, the responsible authority misrepresented the estimates to justify the ballot initiative – which led to AB805 and a reorg). According to the documents that were circulating in June 2016 before the vote, 17% of the funding for Measure M is going to freeways; that’s still a *ton* of money ($20 billion!) but let’s be clear: Los Angeles (!) got their voters to approve a sales tax (!!) that’ll more or less exist indefinitely (!!!) and passed a two-thirds threshold with over 70% of the vote (!!!!) for a package that has an 83/17 split between transit/biking/etc and freeways. That’s enormous political courage, that’s enormously impressive campaigning work, and its lightyears ahead of the thinking of anyone currently at TriMet. So in other words you are having your poorest members of society shouldering more of the burden of more highways and transit through a sales tax. Very progressive, Aaron. 1) As a funding mechanism, sales taxes can be designed to be less harmful to low-income folks (ie, sales tax exemptions on basic necessities like food, diapers, the like) and frankly I’d challenge the notion that a sales tax is necessarily more regressive than other forms of raising revenue we have locally, especially if the revenues are directed into investments that explicitly low-income communities. (if we get campaign finance reform so we have the muscle and political clout to significantly raise taxes for infrastructure on the wealthiest 20% of society, i’m down with that too, but that’s a different set of political reforms for another day’s discussion). 3) A litany of los angeles’ environmental justice communities signed on to Measure M; i trust their judgement as to whether they believed the sales tax was a fair way to raise revenue to remedy the economic/public health/climate implications of Los Angeles’ abysmal transportation system. 4) my text above was not even discussing the notion of sales tax in the first place, as much as the acknowledgement that the split between transit/freeways in Measure M was indeed 83/17. 5) the ad-hominem attacks seem kind of bizarre and unnecessary, considering we’ve met and discussed our values in previous circles when you still lived in town, and the whole central point of my article was less about specific funding mechanism ideas and more about the notion that we desperately need more government accountability and transparency so that equity concerns can be more appropriately vetted. Doesn’t Metro have the ability to take over TriMet? That would make TriMet’s board elected at least. Metro Charter, Chapter 2, Section 7, Paragraph 4. But that would mean taking on all of TriMet’s debt, including unfunded pension and health care liabilities, while subject to Measure 5/50 property tax limitations. It will never happen. I agree it currently seems far fetched. But then again, we’ve got a new Metro President, as well as competitive council elections in two Metro seats. There are going to be some new voices at the table, many of them younger, more progressive, reform-minded, and interested in shaking things up. 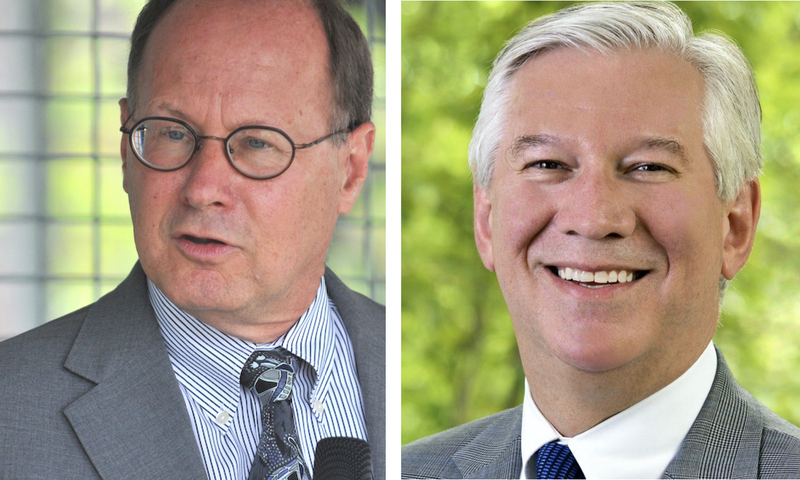 Even District 2, which represents Clackamas County, has three candidates who are actively interested in embracing regional government (as opposed to being recalcitrant and angry at regional collaboration, as many Clackamas County voices have been for decades). If we want to see Metro seriously consider such an option, we have to start talking about it and forcing the question. Furthermore, even if Metro doesn’t “take over” TriMet anytime soon, the fact that they have an election in which we can ask candidates about their thoughts on the matter make the agency *much* more responsive to these concerns than TriMet, where there’s no lines of accountability. That’s one of the takeaways of the article: at least Metro has to be responsive to voters, who may have priorities and preferences that are very different than the agency’s status quo, and there will have to be an effort of reconciliation. We don’t have any mechanisms to have this conversation with TriMet at present moment. Metro runs solid waste, the zoo, some parks and the UGB; other than that it’s role is more regional planning and coordination, but they could certainly still step up in that regard. IMO, Metro >>> ODOT, regionally, if they were so inclined. But like most MPO’s nationwide, they have less spine than PBOT (who have less than ODOT), so relying on Metro isn’t going to help you one iota. Frankly, if you want a transit system that is more democratic than you have with TriMet, then you are going to need a municipal transit system, which will have it’s own troubles and corruption, but al least you’ll be better able to control it, at least as well as you control your city council and PBOT. TriMet is stuck in a death spiral serving mostly non-choice riders, which is to say, people with limited transportation options. The more the system is designed to meet their very real needs, the less it responds to those who have other options. But because fewer choice-riders see any “benefit” from the system, they will systematically defund the system or at least halt major initiatives to expand the system (See: PMLR and the SW Corridor). All you have to do is ride around a little bit and you will see how sad it has become. Where once planters and benches sat, now security cameras, fences and litter. Where order and cleanliness were once the hallmark of MAX, now mental illness, disruptive behavior and biohazards. These are just a couple of examples. TriMet bus has not seen such a dramatic diminution in quality but is more a case of the equipment not evolving fast enough and congestion. Buses today are largely the same as 30 years ago. Imagine if you were still driving a 1985-era Buick LeSabre. We need a focused and concerted effort to innovate and build better transit busses from the federal level. Right now there is no competition for better equipment. Everything has been negatively effected by the yawning chasm between rich an poor and this is not surprisingly mirrored in public services like transit. I fear what the future will bring. Also, Aaron, I would say what you are responding to is politics. Like it or not, it’s a game of give and take. You have to make trades and deals to get things done unless you are a obstructionist know-nothing republican, in which case, you want nothing to get done when you cant get your way 100% of the time. I wish it was not so. You’re absolutely right I’m responding to politics. I’m suggesting our political systems shouldn’t be standing in the way of the investment paradigm shifts that are necessary if we’re going to hit our carbon, traffic safety, air quality, congestion and public health goals. If our current political system can’t solve us from destruction, well, maybe we need reform of our current political system; better lines of democratic engagement so that the needs of the the electorate are better heard and enacted by their leaders. sometimes politics is not an apathetic game of status quote “give and take”. sometimes the old game is overturned by the work and conviction of concerned residents. I’m glad you’re so optimistic, given the kakistocracy in charge of our country right now. i mean what other choice do we have? we either go all-in on tearing down the bad structures that perpetuate nonsense or we’re acquiescent to governing institutions and individuals that will lead us to global peril. Have you explored the possibility of a city-run transit system? PBOT already runs streetcar and the pill-hill gondola, contracting out to TriMet for services. Talk to Ride Connection to see how a city system could be set up. Or use Seattle’s system, where the rail and express busses are run by a regional agency, and the local bus system is run by the individual counties. Then Multnomah could beef up local bus service without worrying about the suburbanites. And sometimes it’s overturned by radicals who want to burn the system down, or make it submit through starvation, like the Don McIntire/Bill Sizemore crowd. nothing about bill sizemore is radical. he is a paleo-conservative who supports a return to a more intolerant and segregated era. You can have radicals on the right as well as the left. sizemore’s agenda does not seek thorough political or social change; rather, it seeks to rescind and/or block change. calling sizemore a radical is an example of the authoritarian tendency to transform any word associated with political/change into a pejorative term. Dramatically reducing the size, scope, and power of government would be a pretty big political and social change. Politics is a game of give and take. But, one thing that has become very clear to me over the last couple of years is that institutions, including PDX city council and OR state legislators, are influenced more by external pressure than internal deliberation or vision. People who aren’t bound by give and take have to use their energy to move the needle. Electeds will shrug and tell everyone their hands are tied one minute and then blame advocates for not advocating enough the next. Someday I hope the people in charge of overseeing our transportation future are as articulate and thoughtful as an advocate under the age of 30. As a former Seattleite I’ve been dismayed over nearly a century (no exaggeration) by the repeated failures of regionwide ballot measures to expand transit, despite these measures passing overwhelmingly within the city of Seattle itself. It was in fact the main reason my wife and I left Seattle in favor of Portland so many years ago. And I’m heartened by the eventual success of the ballot measures since we moved. On my recent visit to Seattle I was heartened to be able to ride one of the recently completed works: a subway (partly leveraging the existing bus tunnel) that runs the entire length of downtown, continuing under Capitol Hill and out to the UW. It works beautifully. This would be equivalent to a subway connecting NW 23rd, the Pearl, Old Town/Chinatown, downtown and the Lloyd District, with one of the downtown stops attached directly to Pioneer Place. Not huge, but a great start. And much, MUCH more is coming: pursuant to the 2016 measure, construction is already well underway for a northbound extension from the UW through Roosevelt to Northgate, and a new east line connecting downtown to Bellevue via Mercer Island. I was frankly surprised the measures passed. They didn’t include significant funding for roads/cars, other than expanded Park & Rides. Somehow the miracle happened, even though suburban voters there (80% of the region’s population) had been notoriously resistant to funding transit in the past – which is why I always appreciated that in the Portland area, transit projects (like freeway projects) have not been put up for a vote, and until recently Portland was far ahead of Seattle in its public transit vision. I wish I understood how Seattle hit the magic formula, other than that it’s a much more densely populated area, and even dedicated car commuters recognized that transit improvements would benefit them by taking other cars off the road. 1. Drivers have to keep getting sick of traffic. Advocating for combined transit-and-road projects severely undermines that. It is not a good idea for TriMet to support the proposed Rose Quarter freeway expansion. 2. Although rail continues to be important (especially in the SW corridor), focus on more cost-effective transit expansion. To me that means BRT. And not just dedicated-ROW heavy BRT, but arterial BRT. Frequently derided by purists as “BRT-lite” or “fake BRT”, aBRT has been a smashing success both in Seattle (which now has 6 lines), and here in the Twin Cities (1 line open so far, a second one breaking ground this month, and a new line coming every year or two for at least the next decade). I’m very impressed with the aBRT experience in both regions: it provides near-light-rail speed and convenience (fast boarding, no farebox delays, pay on the platform, roll wheelchairs and bikes directly on from the platforms, WiFi on the vehicles, electronic signboards at every station, signal preemption etc.) for about a tenth of the cost. Light Rail still makes sense for the most dense corridors, but BRT (both aBRT and hBRT) is the future once those corridors are built out – a state Portland is about to reach. Sorry, didn’t mean to say that I’ve been dismayed for nearly a century, but I’ve been dismayed by the ballot failures that spread over nearly a century. That said, yeah, Seattle’s ballot measure successes were earthshaking. I wrote a little about it here if you’re interested, including a bit from the guy who ran those campaigns. It should be noted that only one Trimet board of directors is a frequent user of the system DESPITE THE FACT THAT THEY DON’T HAVE TO PAY TO USE IT! These are folks who simply don’t need or want to use the transit system that they are building and that is in my opinion one of the roots of the problem. I’ve oftwn wondered this as it pertains to PBOT. Hell, even the mayor, when he isn’t letting people take his car home with them. The TriMet board is an embarrassment to democracy and has been for a long long time. I say focus the ire at them not Doug. I encourage everyone to watch a TriMet board meeting. These people are supposed to be representing us and they don’t know how much the fare is or what a bus costs or how many thousands of employees TriMet has. Excellent essay but it makes an assumption that is false. The assumption that ‘government’ is a benevolent force and if ‘we the people’ can just convince them through logic how they are wrong they will come around to do what is right. That ain’t gonna ever happen. There’s a pot gold that was stolen (that’s not hyperbole, these ‘lawmakers’ decided that the public should not be entitled to vote on this $5.4 billion grab) and is now available to the various special interests. One of those interests is the highway construction companies. They are just getting their cut. That unfortunately is the way government in 2018 functions. It’s no longer about us. The elites have total control of the government and its processes. The function of the Trimet board is to keep the public OUT of the process. METRO will never assume control of TRIMET because it was created specifically to be kept out of accountability processes. Portland never had any real dedication to transit or biking, it was all hype. A few crumbs and a brilliant marketing campaign make people think Portland is a bike and transit nirvana. Hell, the brilliant minds in charge never even thought of bus express lanes, private citizens stuck in traffic jams on buses had to come up with that. Al, I share your frustration that powerful entities are calling the shots, but I don’t share your nihilism that it’s nothing a bit of participatory, engaged democracy can’t help steer towards better outcomes. That’s the point of this essay: to point out that TriMet (an agency I know you have strong feelings about) would perform better and provide services better to its constituents if there was more democratic accountability. This isn’t just about the freeway: imagine if a candidate decided to run, for instance, on a campaign of eliminating sexual harrassment on public transit. That’s a real issue! It’s a very major problem, that doesn’t get discussed much because groups like OPAL and Bus Riders Unite, amazing and inspiring as they are, don’t have specific pressure points they can use to coerce politicians into being accountable. It wouldn’t be difficult for TriMet to set aside a decent chunk of money and research what has been done to eliminate groping in trains on transit systems around the world – there might be some solutions! and it’d be a totally worthy campaign to run, and it’d be awesome if someone ran for TriMet board the way people run for school board now as springboards for higher political office. Taxation is not theft. It just isn’t. It’s why we use different words, with different meanings, to describe those different things. Taxation without transparency or accountability IS theft. When you combine such taxation with shortfalls in education, vote manipulation and/or suppression and measures that divert tax revenue away from social services that help the poor and invalid, then you have a well-oiled theft machine. Nor is this a new story. Wars over the size and placement of the rich-poor divide have been going on since the waning days of Feudalism. Sadly, while I applaud the author’s optimism, I don’t share it. Right now the pendulum has swung so far away from meeting the needs of the many in favor of lining the pockets of the too-rich few that it will take quite a long time to bring it back to something resembling common sense and humaneness. If I shared Mr. Brown’s youth, I’d be perhaps a little more optimistic. The way our taxes are collected and spent is, in my book, tantamount to theft. Because those who govern us aren’t taking any notes from voters on how to do it more responsibly. So yeah, I call it theft. Either way it doesn’t bode well for our near future. Even if the government is corrupt, the act of levying taxes is not theft. Calling it that just feeds the right wing propaganda machine. If freeway expansion is so obviously detrimental to the TriMet’s goals and ability to provide service to the region, why has TriMet supported it? Because TRIMET knows riders don’t show up to ride MAX, esp. WES in large quantities and the MAX system is a magnet for criminal activity. 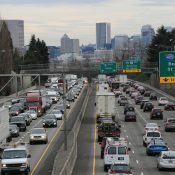 The big reason however is VOTERS don’t support MAX expansion, so the only place to go to get money is ODOT to fund the ill-conceived failure called MAX. I see a bifurcated Portland: essentially inner and outer. 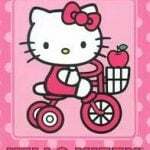 Inner appears to cater to the well educated liberal elite who have transportation options because they can afford it. They travel by car because they can afford it in every regard or the live close enough to ride their bikes to work. Public transit is the last option. Outer Portland appears to be the region that is economically depressed. People sink their disposable incomes into their cars and drive all over the city because transportation doesn’t serve their needs of where their jobs are at. If people are taking transit, it’s not because they want to but have to. 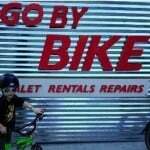 Bike commuting isn’t even an option because of distance, safety issues, and family needs. The transportation problem in Portland seems to stem from the decimation of the lower-middle class… I suspect people living in the Laurelhurst Neighbor aren’t too worried about the expansion of the Max line. I’ll bet people in that neighborhood would strongly support such an expansion. I think you’re getting at a true statement: that there are wealthy people who are ostensibly progressive but won’t vote for investments that challenge their priviledge that land-ownership in a certain exclusive zip code brings them. I don’t disagree with any of this; if anything, i’m suggesting that on aggregate, at the regional levels, many voices for desired changes in our built environment are getting lost because we don’t have democratic mechanisms to ask for them. There are wealthy and nonwealthy, left, right and center, old and young, white and nonwhite voters in numerous parts of this region, and they all have different desires for their community ranging from eliminating fatalities, fighting carbon emissions, reducing congestion, or having reliable bus service. We need a political system that empowers the (vastly larger number of) people in East Portland to express their demands for quick bus routes to job centers and for sidewalks over the petty austerity, NIMBY politics of some of Portland’s central neighborhoods. I’m arguing that the people you stereotype as exclusive NIMBYs are some of the strongest supporters of improved transit in and around Portland, probably to a greater extent than residents East Portland. If “here take my money” isn’t enough, what is it that you want? Maybe you could lend them your shovel. I guess I didn’t do a very good job in my original post. I mentioned the decimation of the lower-middle class and I was referring to how Portland doesn’t really have large scale centralized employers where people can make $20-30/hr, especially in SE Portland. I know we have the Port, industrial parts of Columbia Blvd, industrial Johnson Creek, industrial NW/highway 30. Howver, are any of these served by the Max, no? I imagine people will always drive to these type of employment opportunities.